The turtles and tortoises, Testudines or Chelonia, arose in the Late Triassic and later achieved a diversity of 25 families, of which 13 families and 295 species are extant (Mlynarski, 1976). It seems that early on they hit on a successful design, the 'shell', and stayed with it. Turtle diets are broad-ranging, including herbivores and insectivores on land, and herbivores and carnivores in the water, with diets from jellyfish to fishes. The shell of turtles is composed of two portions, a domed carapace on top and a flat plastron below, which are attached to each other at the sides, leaving broad openings at the front for the head and arms, and at the back for the legs and tail. The carapace is composed of bony plates that form within the skin and these are covered by broad horny scutes in regular patterns (Figure 8.27(a,f)). The plastron is a smaller unit (Figure 8.27(g)) that protects the belly area. The main plates of the carapace are attached to the vertebrae and ribs, whereas the plastron is formed from expanded elements of the shoulder girdle and equivalents of the gas-tralia of other reptiles (see p. 110). 8.27(a, b)) is triradiate with two scapular heads, one facing upwards and one inwards, and a long narrow coracoid running back. The pelvis is smaller, but also three-pointed (Figure 8.27(a, c)), with a narrow iliac blade running up and back, and a narrow pubis and ischium running forwards and backwards respectively. The limbs are short and held in a sprawling posture, and the hands and feet are large in swimming forms. The neck of turtles is long and flexible (Figure 8.27(a)), and the head is relatively small, but strongly constructed. The origin of turtles was seen as rather mysterious until recently, but several studies have indicated that the pareiasaurs and procolophonids of the Permo-Triassic are close relatives (see pp. 113-4). The first turtles, Proganochelys and Proterochersis, show the key features that are common to all modern forms (Gaffney and Meeker, 1983). 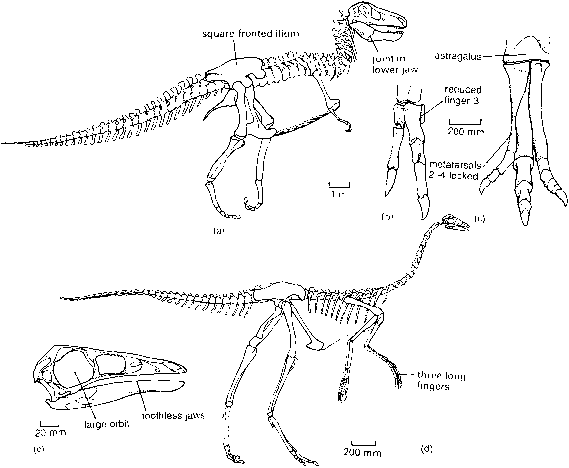 The skull (Figure 8.27(d, e)) is anapsid (no temporal fenestrae) and massively built, being firm and immovable. Proganochelys could no doubt have survived a head-crushing stomp from Plateosaurus.In side view (Figure 8.27(d)), the skull shows two further turtle characters: toothless jaws, evidence of a horny beak and a deep curved embayment on the quadrate that supports a large ear drum. The palate (Figure 8.27(e)) is primitive for turtles because it retains teeth on the vomer and pterygoid, and is linked only loosely to the braincase. In later forms, the teeth are lost and the palate fuses firmly to the base of the braincase. The carapace of Proganochelys (Figure 8.27(f)) is broad, and it consists of several large midline plates, a number of lateral plates and smaller marginal plates that form sharp projections round the margins. 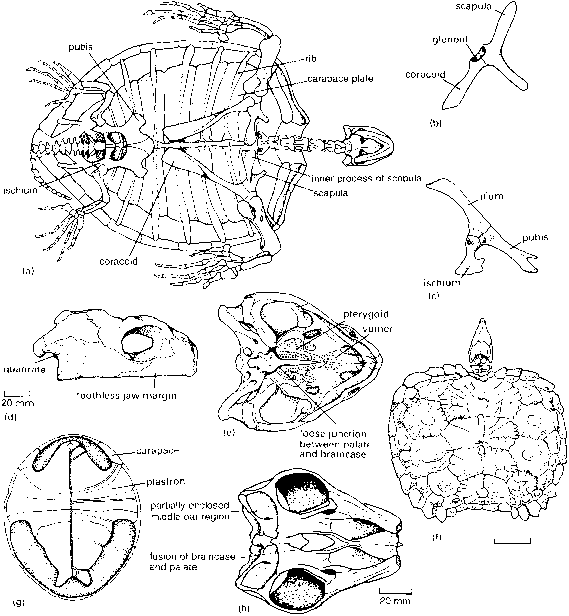 The plastron of Proterochersis (Figure 8.27(g)) is similar to that of modern turtles in being much smaller than the carapace and in leaving spaces for the neck and legs to emerge. 8.27(h)) show fusion of the braincase and palate, and partial enclosure of the middle ear region, but they still retain some palatal teeth and the tail in the South American form at least is still long. The remaining turtles from the Jurassic to the present day form a clade, the Casichelydia (see Box 8.8), composed of two major groups, Pleurodira and Cryptodira (Gaffney and Meylan, 1988). These turtles show modifications to the skull, such as the loss of the lacrimal bone and the tear duct that normally runs through it. There is a single vomer in the palate. The middle ear region is completely enclosed by ventral extensions of the pterygoid and opisthotic to form a bony tube. Most casichelydian turtles, unlike the proganochelyids and australochelids, can retract their heads under the carapace when they are threatened by danger, and the way in which they achieve this distinguishes the two groups today. The pleurodires pull the head in by making a sideways bend in the neck (Figure 8.28(a)), whereas the cryptodires make a vertical bend (Figure 8.28(b)). This distinction works for living turtles, but basal members of both groups cannot retract their necks. More appropriate synapomorphies of Pleurodira and Cryptodira (Gaffney and Meylan, 1988) are found in modifications to the lateral regions of the palate that are designed to reorient the direction of pull of the main jaw muscle mass, the adductors, so that the height for retraction is reduced. In pleurodires, the adductor muscle mass passes over a rounded boss, or trochlea, formed by the pterygoid (Figure 8.28(c)), whereas in cryptodires, the trochlear process is formed further back by the otic capsule, the part of the braincase involved with hearing and balance (Figure 8.28(d)). Proterochersis from the Upper Triassic of Germany (Figure 8.27(g)) is classified as the first pleurodire because its pelvis is fused to the carapace and plastron (Gaffney and Meylan, 1988). Living pleurodires, the snake necks and matamatas, are freshwater in habitat and are limited to the southern continents. Fossil forms are known from all continents and include terrestrial and possibly marine forms. The largest non-marine turtle, a 2.2-m-long pleurodire from the Pliocene of Venezuela, has been named, not surprisingly, Stupendemys. The cryptodires date back to the Early Jurassic, but they radiated only after the Late Jurassic. They fall into six main clades, each characterized by features of the skull and shell (Mlynarski, 1976; Gaffney and Meylan, 1988). Kayentachelys from the Lower Jurassic of Arizona, USA, is the oldest cryptodire. It shows the otic capsule trochlea characteristic of the clade,but still possesses pterygoid teeth, which are lost in later forms. The baenids (Figure 8.28(e)) from the Upper Jurassic to Eocene of North America and Europe have a narrow snout region. The meiolanids (Figure 8.28(f)), an odd group mainly from the Pleistocene of Australia, have broad skulls up to 500 mm wide and armoured with horns. The living cryptodires, the chelonioids (marine turtles), trionychoids (soft-shells) and testudinoids (tortoises), are distinguished from their extinct relatives by characters of the vertebrae and ribs. They also share a general skull outline (Figure 8.28(g-i)) in which the parietals and supraoccipitals extend backwards as a vertical plate with a deep curved conch cut into the skull table on each side. The chelonioids have their forelimbs modified as long paddles that they beat like wings to 'fly' through the water. Some, such as the leatherback, reach shell lengths of 2 m and weights of 500 kg, and Archelon from the Upper Cretaceous of North America (Figure 8.28(j)) is 4m long.